How does celiac disease awareness stack up against other major diseases? In yesterday’s reflection on National Celiac Awareness Month, I mined the data trove that is Google search trends to consider what progress we have or haven’t made when it comes to raising celiac disease awareness in the face of gluten’s and all things gluten-free’s rapid ascent into the limelight. But as the day wore on, I began to wonder. Was I being too harsh on the celiac awareness issue? Were we actually in a better place than I was giving credit for? 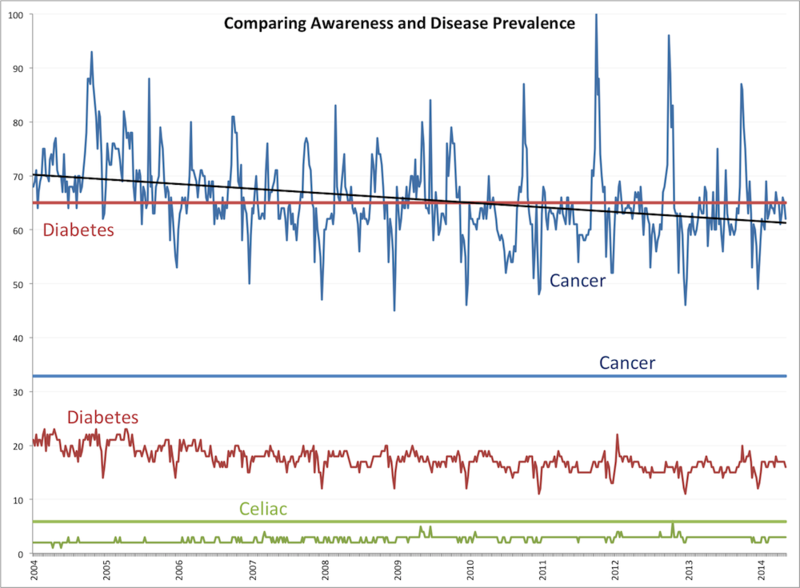 That’s when the fundamental question of this blog post hit me: How does celiac disease awareness compare to the relative awareness for other major diseases? Being the data junky that I am, I decided to find out. First, I began by pulling the past decade’s worth of Google search trends for three terms: “cancer,” “diabetes,” and “celiac.” That alone was encouraging. All three plots were more or less steady over time. Celiac disease was hardly the odd one out. In fact, it was holding its own quite nicely. It remained steady, and even marginally gained when comparing the first and last halves of the past decade. I couldn’t say the same thing for cancer and diabetes. Each exhibited small but definite downward trends, indicating by Google trends proxy a decrease in awareness. This is especially notable (and worrisome) with diabetes, which has been increasing at an alarming rate in the United States. But I didn’t stop there. What I really wanted to know was how did the relative popularity of Google searches for a given disease (i.e., cancer, diabetes, celiac) compare to the relative prevalence of that disease in the American population. Because the data was readily available, I pulled 2010 prevalence statistics for cancer and diabetes, plus the 2010 U.S. census population numbers and the commonly cited 1 in 133 prevalence for celiac disease to come up with an apples to apples number. Google searches for “cancer” were twice as prevalent as the disease. Clearly, cancer is winning the awareness battle. Google searches for “diabetes,” on the other hand, were 70% lower than the disease’s prevalence. Uh oh. That’s not good, and neither is the United States’ diabetes epidemic. And Google searches for “celiac”? They were 50% lower than the disease’s prevalence. Lower than cancer but notably higher than diabetes. We’re not at cancer levels of awareness by any stretch, but for a disease that affects one-tenth as many Americans as diabetes, we’re not doing all that bad in the awareness department. As a matter of fact, if you re-scale the graph based on the combined prevalence of diabetes and pre-diabetes (nearly 26 million Americans plus another 79 million in the year 2010), celiac disease’s relative awareness weighted against its prevalence in the U.S. population gets even better (much better). Halfway through National Celiac Awareness Month, I’m not at all letting us off the awareness hook. Much important work remains to be done. 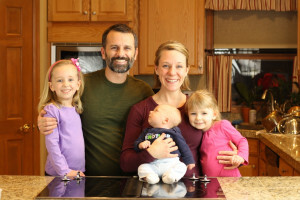 For example, according to stats on the National Foundation for Celiac Awareness website, 83% of Americans with celiac disease remain undiagnosed or misdiagnosed. That has to change (and there are signs that it is). And then there’s the issue of raising awareness among the family and friends of those with celiac disease, restaurants chefs and servers, yada yada. You know the drill. And for sure, this post isn’t meant to be a look over the neighbor’s fence in a disease awareness case of keeping up with the Joneses. Our community has enough to do for its own without worrying what’s going on in other camps. But the next time you’re tempted to lament that celiac disease awareness isn’t where it should be, know that you’re probably right, but that we’re also beginning to make encouraging headway, even as other major health concerns in our country—like diabetes—are going in entirely the wrong direction. 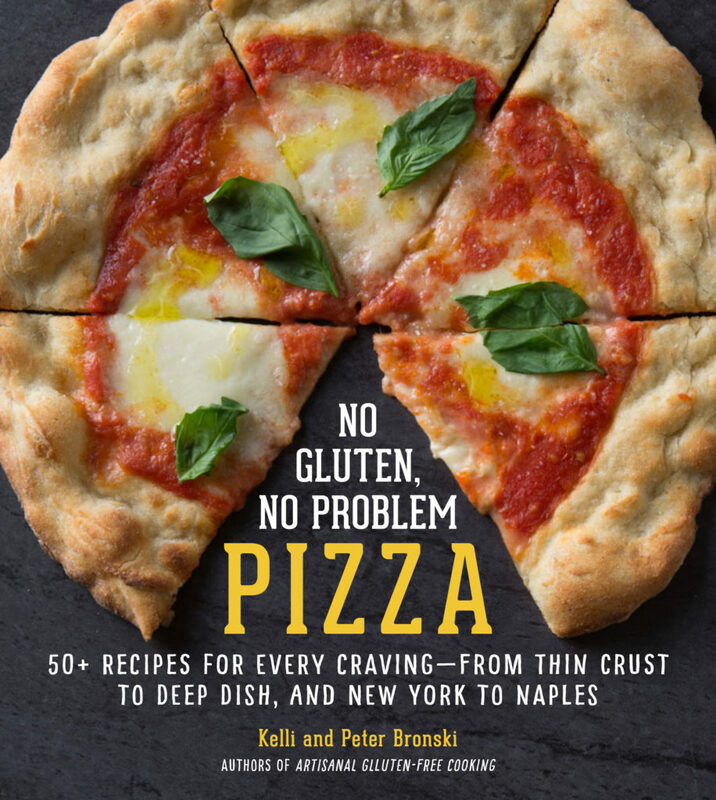 « It’s National Celiac Awareness Month. What Are You Gonna Do About It?